Washington D.C. (December 12, 2014) — This morning, Senator Richard Blumenthal (D-Conn.) announced he expects to bring the Clay Hunt SAV Act to the Senate floor for a unanimous consent vote between 1:00 and 3:00 p.m., regardless of any holds on the bill. At a press conference hosted by Iraq and Afghanistan Veterans of America (IAVA), Sen. Blumenthal declared he will be asking the Senator blocking the bill from consideration to step forward. 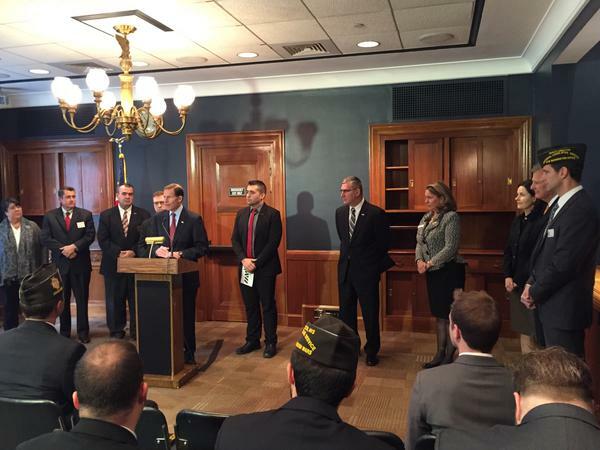 IAVA joined Senate Veterans Affairs Committee Chairman Bernie Sanders (I-Vt.), Sen. Blumenthal, Sen. John Walsh (D-Mont. ), Susan and Richard Selke, parents of Clay Hunt, and Veteran Service Organization partners, to implore members of the Senate to pass the Clay Hunt SAV Act before they adjourn for the year today. The Clay Hunt SAV Act, which unanimously passed the House on Tuesday, will improve access to quality mental health care and combat veteran suicide. The legislation is named after Clay Hunt, an Iraq and Afghanistan war veteran who died by suicide in 2011. The bipartisan bill, which now has 19 Senate co-sponsors, is currently being anonymously held by one member of the Senate. “Every veteran deserves the care that Justin Eldridge from Connecticut, and Clay Hunt, and countless others never received,” said Sen. Blumenthal. Eldridge, a U.S. Marine from Waterford, Conn. who served in Afghanistan, died by suicide in 2013. Photo courtesy of the Office of Sen. Blumenthal. Note to media: Email press@iava.org or call 212-982-9699 to speak with IAVA leadership or Susan and Richard Selke about the Clay Hunt SAV Act.